After the success of Candyman, both odds and opportunity dictated that a follow-up was inevitable. With the previous decade’s psychos either dead (read: slasher movie dead) or on hiatus, Clive Barker’s latest cinematic monster found himself in position to fill a profitable void. Thus, 1995’s Farewell to the Flesh came as no surprise; what is perhaps more surprising is that it arrived with Bill Condon at the helm. It’s a retroactive surprise to be sure (at the time, I doubt that anyone could have guessed we’d one day refer to him as “Oscar Winner Bill Condon”), but it’s an odd chapter in the director’s eclectic career. In hindsight, Farewell to the Flesh becomes an interesting case of examining the emperor’s new—or, in this case, old—clothes: thanks to the auteur theory, this obligatory slasher sequel is ripe for reexamination. Okay, I’m mostly bullshitting around. Candyman: Farewell to the Flesh pretty much is an obligatory slasher sequel that aggressively adheres to genre expectations: set a few years after the original film, the titular Candyman (Tony Todd) is once again only considered a myth, confined to schoolyard whispers and lecture halls. When professor Phillip Purcell’s (Michael Culkin) book tour brings him to New Orleans, he sweeps the events of the first film under the rug and reiterates the urban legend. The sequence serves as a familiar slasher prologue that bridges one film to another, as this lone returning character (except for Todd’s Candyman) is quickly dispatched and yields to the next set of victims: the Tarrant family, an Old South institution whose bloodline stretches back for generations. After son Ethan (William O’Leary) is implicated in Purcell’s murder, his mother (Veronica Cartwright) and sister (Kelly Rowan) rally in support. Rowan takes the reins as the lead in the role of Annie, a schoolteacher who unwittingly becomes Candyman’s latest obsession, a conceit that allows Farewell to the Flesh to retrace its predecessor’s steps. It strolls a little further down the path, though, by illuminating Candyman’s backstory even more. No longer spoken about in general, urban legend terms, he’s given a name, a time, and a location in history, something that slasher sequels often demand. As is typically the case, it has the effect of further demystifying the monster; granted, Candyman’s story was always tinted with tragedy, but these further revelations only diminish his presence. There’s a reason campfire stories don’t have sequels. I’ll concede that Candyman at least leaves more room for this sort of humanizing backstory, and this film’s events aren’t as devastating as, say, the various additions to the Michael Myers mythos. 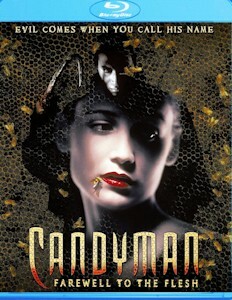 It does lead to some intriguing examinations of cultural and familial guilt: in the first film, Candyman existed as a vengeful reflection of America’s treatment towards African-Americans; here, there’s something more intimate at work as a family must confront their own complicity and subsequent denial of that hideous legacy. Ultimately, it’s a film about accepting what has been otherwise repressed, something that I think might have appealed to Condon, who would go on to further explore this with Gods and Monsters a few years later. Of course, Farewell to the Flesh is also mostly about a restless spirit carving victims from groin-to-gullet, and it’s quite a bloodbath. Predictably, the sequel ups the ante with the gore quotient, with some sequences serving as elaborately staged death sequences that play into the grandiose, operatic vibe of both the original and this sequel. Condon shows an early flair for the supercharged theatricality that would serve him well on the likes of Dreamgirls and his borderline deranged Twilight sequels. With composer Phillip Glass back in tow for this sequel, Farewell to the Flesh is every bit the stylish, Grand Guignol successor that the original is: it has a moody, voodoo-soaked verve thanks to a Mardi Gras setting that doesn’t go underutilized by Condon. Even during the film’s quieter moments, the director scatters ominous shots of graffiti-tagged walls and religious processions, with the recurring image a cosplay Christ obviously emphasizing Candyman’s own martyrdom. The setting is a natural fit for the Candyman mythos, perhaps even more so than the urban confines of the original—the notion that there is real, sinister menace underpinning an amusing urban legend feels at home with a locale that buries voodoo beneath a façade of revelry. If there were a single interesting person besides Candyman himself inhabiting this atmospheric space, Farewell to the Flesh might easily stand alongside the original. Each character is an underwritten cliché betraying the cast at every turn, especially Rowan, who becomes little more than the latest object of Candyman’s affection. She’s a schoolteacher with an interesting subplot concerning one of her students that goes missing after the spirit is summoned, and it becomes a footnote soon enough. Likewise, the film scatters some broadly-sketched oddballs throughout, such as Timothy Carhart as Annie’s weirdo husband and Cartwright as a cantankerous Southern belle who’s resigned herself to losing a battle with cancer. Anyone noteworthy simply isn’t around long enough to make much of an impact, which allows Candyman 2 to follow the recipe of the slasher follow-up: a sprinkle of added mythology, a lot of familiarity, even more bloodshed, and a tease for another sequel. To this end, it’s a decent success, especially with Condon on board to infuse the proceedings with some style; truly, the most interesting thing about is its place in its director’s oeuvre, where it rests as a curious precursor to later accomplishments. Even though Farewell to the Flesh isn’t as widely regarded as the original film, it has nonetheless beaten the classic to Blu-ray thanks to Scream Factory’s latest release. The studio hasn’t designated it as a “Collector’s Edition,” but it’s difficult to tell: once again, the presentation is up to snuff with a nicely restored hi-def transfer and two DTS-MA tracks. It is perhaps a tad lighter on supplements than some of Scream’s other releases, as it’s highlighted by a commentary with Condon and rounded out by a couple of separate interviews with Cartwright and Todd. The latter is a 25-minute retrospective on the entire franchise that’s pretty enlightening—it turns out that Todd isn’t exactly a fan of the third film, which I doubt is due for a special edition treatment anytime soon (feel free to prove me wrong, Scream Factory!). That supplement serves as a reminder that this was a franchise that once existed; as it has rested dormant for over fifteen years now, my guess is its next resurrection will be in the form of a remake. Some Hollywood executive will dare to whisper the name enough times, and we’ll be granted a new Candyman, which is sort of a shame. With only three films under his belt, it can hardly be argued that Todd’s Candyman is an overexposed icon. Even in this comparatively lackluster follow-up, he's a charismatic figure marked by a captivatingly forlorn demeanor and lyrical dialogue; Candyman is a fascinating horror villain that forces audiences to reckon with stereotypes and socially institutionalized injustice. It's a shame he never had a chance to reclaim the heights of his original outing. Hell, I would have settled for a handful of sequels that were as decent and entertaining as Farewell to the Flesh. It’s too bad we couldn’t just conjure them from a mirror.